Canada Archives · Stop the Cap! Criminals are supposedly having a field day robbing cell phone stores in Canada after regulators ordered all cell phones to be sold unlocked, allowing customers to bring their devices to other carriers. 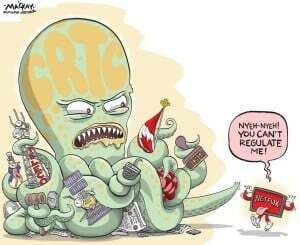 Because Canada’s three major carrier-cell phone marketplace is seen as less competitive and more expensive than the United States, the CRTC has tried to keep wireless service costs under control by regulating some of the practices of the barely competitive Canadian market. One such initiative is the ban on charging unlock fees on devices, which carriers used to deter customers from changing providers. As of last December, carriers could no longer collect an average of $50 to unlock each device, and new devices had to be sold to customers in an unlocked state, allowing them to be used on any compatible wireless provider’s network. 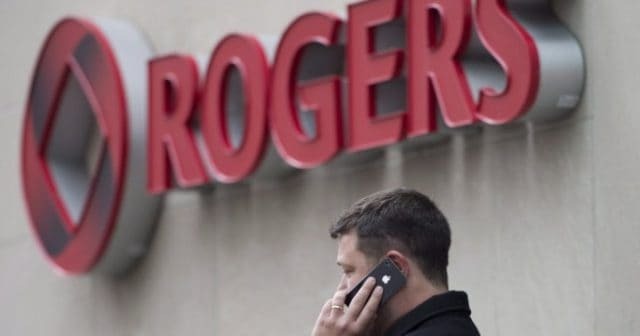 Rogers, which runs Canada’s largest cable operator and has a major market share of Canada’s wireless market, claims the unintended consequence of the CRTC’s unlock policy is a 100% increase in cell phone thievery during the last six months the policy has been in effect. Rogers reports thieves are stealing brand new cell phones in the mail or off a customer’s front step after the shipper drops the package off. Brazen armed robberies of cell phone stores have been more common in the United States, but providers claim criminal gangs are now taking their business north of the border, holding up stores and running off with dozens of valuable phones. 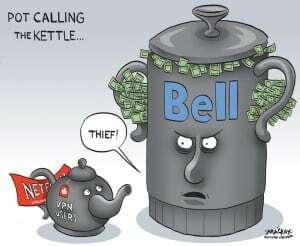 Both Bell and Rogers warned the CRTC last year thievery would be the likely result of providing unlocked phones. Consumer groups claim both providers have a vested interest complaining about the new unlock policies. In 2016, Canadian telecom companies made $37.7 million from fees related to unlocking smartphones. That was a 75 percent increase in fee revenue since 2014. Canadian consumers called unlock charges “ransom fees,” and were particularly upset paying fees after they paid off the device. “You should be able to unlock it [for free] at the very least once you’ve paid off the device. You own it,” John Lawford, executive director with the Public Interest Advocacy Centre in Ottawa told the CBC. Lawford calls unlock fees an intended consequence of the industry’s own policies. Cell phone companies sell devices manufacturers have to lock at the behest of carriers, and then consumers face fees paid to the same carriers to undo the lock. Canada’s providers often point to examples of armed robberies and truck hijacking south of the Canadian border as a reason to be concerned about employee and customer safety. In the view of some, an unlocked smartphone worth more than $500 is an invitation to steal. Bell told regulators things are certain to get worse in Canada. “It appears that illegal activity may have shifted from the U.S. to Canada as some [American] carriers have begun to lock devices,” Bell officials told the CRTC. Bell was referring to Verizon’s unilateral announcement it began relocking smartphones in February, despite its agreement not to as part of an acquisition of 700 MHz spectrum in 2008. That prime spectrum came with strings attached, including a requirement not to disable or restrict devices that use the spectrum, something locked phones do. Verizon previously tested the waters on reintroducing locked cell phones during the second term of the Obama Administration, but the idea met immediate resistance from FCC Chairman Thomas Wheeler. In 2018, Verizon found a much more receptive audience from the Republican-dominated FCC under Chairman Ajit Pai, and has gradually returned to locking down devices on Verizon’s network. Last spring, Verizon began locking all smartphones sent to stores, to be unlocked after purchase. Verizon argued this would deter armed gangs from hijacking deliveries or raiding stores to steal phones by the dozens, to be resold to the eager black market. If thieves obtain a stolen, locked phone, it cannot generally be activated by the customer unless taken to an authorized retailer. This theoretically leaves thieves stuck with worthless phones, which is why Canadian carriers claim the country’s unlocked phone policy will draw American thieves north. But critics suspect financial motives hold more sway. In addition to charging lucrative fees for unlocking phones, customers unable to take their device with them to a new carrier can effectively deter a provider change, especially for family accounts where multiple devices would need to be moved. Others claim locking phones is not the best way to deter thieves, because an unscrupulous Verizon employee or reseller can still unlock them for thieves. The wireless industry already claims to have a voluntary, industry-led initiative to dramatically reduce theft — a national database of stolen/lost phones. Under this system, a would-be customer is denied activation if their device’s unique ID appears on a list of stolen or lost phones. Fierce competition by eastern Canada’s largest internet service providers are driving down prices across the Greater Toronto Area by as much as 45%. Bell’s fiber to the home service, making its way across parts of the GTA, is now offering unlimited gigabit (1,000/940 Mbps) internet for $79.95 a month, a major drop from its original price of $149.95, if customers sign up before the end of July. Those signing up by July 7 can also get a $50 gift card. 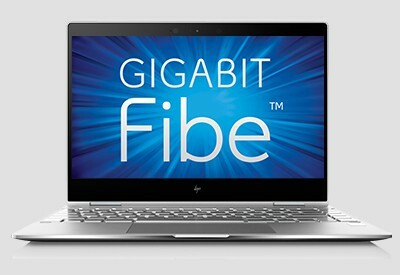 Rogers, the country’s biggest cable company, has been pushing its own limited time promotional offer for its gigabit (1,000/30 Mbps) package, which is more widely available than Bell’s Fibe but also suffers from anemic upload speed. Rogers was selling the package for $152.99/month, but it’s now $79.99 for the first year. The offer is good throughout Ontario, New Brunswick, and Newfoundland. The two telecom companies are trying to boost subscriber numbers during the slow summer months when quarterly financial reports can show a decrease in customers. Canadians have generally had less access to gigabit speed plans than their American neighbors. Experts believe these companies are cutting prices to hook people on super-fast internet plans that will change consumer attitudes about gigabit speed from an unaffordable luxury into a necessity. Like Americans, Canadians are gravitating towards faster speed plans at an accelerating rate. They also continue to choose unlimited plans wherever available. Rogers: Offer available for a limited time to new Rogers internet subscribers within Rogers cable service area in Ontario (where technology permits). Subject to change without notice. Data usage subject to Rogers Terms of Service and Acceptable Use Policy. See rogers.com/terms for full details. Taxes extra. One-time activation fee of $14.95 and one-time installation fee (waived for Self-Install; Basic $49.99 or Professional $99.99) apply. Savings as compared to regular price for 12 months. Advertised regular price applies in month 13, subject to any applicable rate increases. Speeds may vary with internet traffic, server gateway/router, computer (quality, location in the home, software and applications installed), home wiring, home network or other factors. 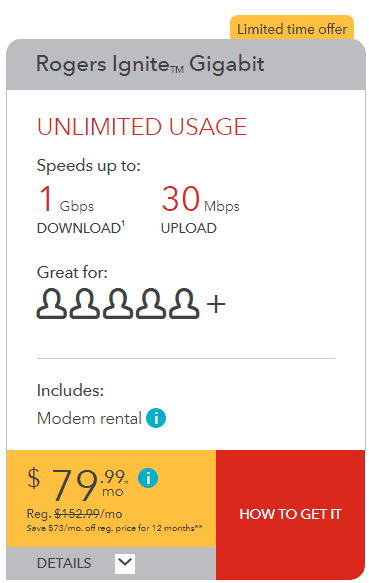 See Acceptable Use Policy at rogers.com/terms. 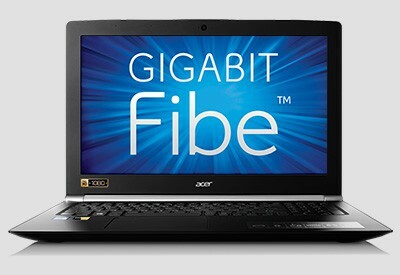 An Ethernet/wired connection and at least one additional wired or wireless connection are required to reach maximum download speeds of up to 1 Gbps for Rogers Ignite Gigabit Internet. Offer available until July 31, 2018 within Rogers cable service area (where technology permits) to new customers subscribing to Ignite Internet 60u or above. Bell: Offer ends on July 31, 2018. Available to new residential customers in Ontario, where access and technology permit. For certain offers, the customer must select e-billing and create a MyBell profile. Modem rental required; one-time modem rental fee waived for new customers. Subject to change without notice and cannot be combined with any other offer. Taxes extra. Other conditions apply, including minimum system requirements. Subject to compliance with the Bell Terms of service; bell.ca/agreements.. Speeds on the internet may vary with your configuration, internet traffic, server, environmental conditions, simultaneous use of Fibe TV (if applicable) or other factors; bell.ca/speedguide. $50 gift card promotion: Offer ends on July 7, 2018. The selected internet tier must include unlimited usage. An unloaded gift card will be mailed after the customer maintains a continuous subscription to the same eligible Bell services and has an account in good standing for 60 days following the installation of all services. All services need to be activated by July 31, 2018. Not combinable with any other offers or promotions. Subject to change without notice. One gift card per account. When received, customer must register the gift card online at bellgiftcard.com to request loading of the amount. Allow 30 days for gift card to be loaded and ready to use. If you cancel your services before you activate your gift card, you will not be able to use your gift card. Gift card and use are subject to the card program. Other conditions apply; see bell.ca/fullinstall. Bell Expands Fiber to the Home Service to Oshawa, Ont. Bell today announced it will spend $100 million dollars to expand its all-fiber network to 60,000 homes and businesses in Oshawa, Ont. The Bell Fibe upgrade will bring gigabit upload and download speed to the community, located east of Toronto. It is part of Bell’s larger plan to upgrade 1.3 million homes and businesses across the GTA/905 region around Toronto to fuel southern Ontario’s digital economy. Earlier this month, Bell launched its all-fiber network in the city of Toronto, which reaches more than one million residents around Canada’s largest city. Bell’s network is currently capable of delivering up to 40 Gbps broadband speed, and is infinitely upgradable to even faster speeds in the future. Residents will be able to subscribe to the new service beginning this fall. New customers will pay $79.95 a month for gigabit speeds for the first year, $149.95 a month after that. A $59.95 installation fee also applies. Bell’s fiber network now extends across more than 240,000 kilometers and is Canada’s largest fiber network. Bell provides fiber broadband in four Atlantic provinces, Québec, Ontario and Manitoba, serving 9.2 million customers over its older fiber-to-the-neighborhood network (similar to AT&T U-verse) and over 3.7 million fiber to the home subscribers — a number expected to exceed 4.5 million by the end of this year. Oshawa will join several other “all-fiber” cities across Canada, which include St. John’s, Gander, Summerside, Charlottetown, Halifax, Sydney, Moncton and Fredericton — all in Atlantic Canada, Québec City, Trois-Rivières, Saint-Jérôme and Gatineau in Québec, Cornwall, Kingston, Toronto, North Bay and Sudbury in Ontario, and Steinbach and The Pas in Manitoba. Bell unveiled its major Montréal all-fiber project in 2017 and other major new centers getting Bell Fibe to the home will be announced later this year. Heritage Minister Mélanie Joly blunders through the dicey issue of Canadian content on Netflix in a press tour called “disastrous” by critics. The arrival of Netflix Canada and its tens of thousands of alternative on-demand viewing choices has had defenders of Canadian culture up in arms ever since the American interloper showed up. For Canada, the dominance of their neighbor to the south has always presented a challenge to a country that fears having its cultural independence steamrolled and its official two-language experience watered down by an avalanche of English-language content. Canadian broadcasters and cable networks are governed by regulations that require they reserve at least 50% of their program schedule for Canadian content (the percentage varies slightly for the Canadian Broadcasting Corporation/Société Radio-Canada — Canada’s public broadcaster, and Canadian cable networks). Because Canada is a much smaller media market than the United States, finding the money to produce enough high quality Canadian TV shows and movies has always been a challenge. Most recently, Canada’s telecom regulator, the Canadian Radio-television and Telecommunications Commission (CRTC) mandated that broadcasters spend 30% of their revenues on original Canadian content. As a result, many commercial networks and stations spend that money on cheap reality shows or news content to satisfy Canadian content requirements. While that fulfills the government mandate, it doesn’t always fulfill the demands of many Canadian viewers that prefer to watch something else. Netflix’s streaming service in Canada competes directly with those broadcasters, as well as Canadian cable and phone company on-demand services, but is not subject to the same content laws because the 25-year old law governing broadcasting was written before there was the prospect of online streaming alternatives. In less than a decade Netflix has grown its original business renting DVD’s through the mail into a multi-billion dollar international streaming business that has deeper content acquisition pockets than any Canadian media entity. The Liberal Party of Canada is trying to manage Canadian content rules now 25 years old, before the era of streaming video. There is also a technology shift in play here. What exactly constitutes “media” is open to debate. Traditional broadcast media now competes with newly emerging, and largely unregulated digital social media (a-la Facebook, Twitter, etc.) and online over-the-top services (Netflix, Hulu, YouTube, etc.) Broadcasters are regulated in the public interest and have lived under that framework for decades. Upstart new media relies on an internet platform that has never been significantly regulated at all. Efforts by the government and Canada’s creative community to get Netflix Canada to follow the Canadian content model has largely failed, and it seems unlikely Netflix will ever see itself tied down by content or language quotas. It flies in the face of Netflix’s marketing — giving customers unlimited access to the content they want to see, not what a bureaucrat in Montreal or Ottawa wants customers to see. Netflix has hired some high-priced lobbyists to make sure their interests are represented before federal and provincial officials, and it has been a constant battle over the last two years as the service confronts content regulators, those upset about the service’s lack of French Canadian titles, and the desire by some of Canada’s political parties and provinces, Quebec notably, to subject Netflix to federal and provincial sales and value-added taxes (GST/HST). The federal government, led by Prime Minister Justin Trudeau, has refused to impose these kinds of taxes on Netflix or other foreign-headquartered internet services, despite the fact many fellow members of the Liberal Party think it should. The Standing Committee on Canadian Heritage called for an internet tax last June, and content creator groups have lobbied the government hard to demand Netflix be required to substantially invest in homegrown Canadian productions envisioned, filmed, and produced by Canadians. the ongoing fear of Canadians that their cultural sovereignty will be washed away by an American cultural tsunami. Some Francophone tabloids in Quebec specialize is assaulting all-things-Liberal, especially Mélanie Joly. Trudeau’s point person on the Netflix controversy in 2017 was Canadian Heritage Minister Mélanie Joly, who was swept into the political maelstrom during a cross-country tour to promote the government’s new Creative Canada cultural policy. By all accounts, it was an unmitigated disaster for the government. Joly’s performance in Quebec — her home province where she serves as MP for the Ahuntsic-Cartierville riding in Montreal, managed what few thought possible — uniting critics from the province’s governing Liberals with the sovereigntist Parti Québécois and the left-wing party Québec Solidaire. In Quebec, the debate over tax fairness shared the stage with concerns about how much attention Netflix will pay producing French Canadian content. In hopes of assuaging concerns, Joly announced Ottawa would increase investment in the $349 million Canada Media Fund to make up for shortfalls from declining contributions based on decreasing revenue from Canadian cable operators. She also promised $125 million to promote Canadian productions abroad. Heads that first nodded in agreement over the announcement quickly froze after Joly also announced Netflix would be exempt from federal sales tax in return for a five-year commitment to invest $100 million annually in Canadian content and $25 million specifically for “market development” of French-language content, whatever that means. The lack of any specific commitment on French language programming went over like a lead balloon and ignited a firestorm of criticism over the perception Joly was going to rely entirely on Netflix Canada to protect and manage francophone programming on its own terms. Joly also made little headway defending the Liberal government’s sales tax policy exempting Netflix. Appearing on Cogeco-owned CHMP-FM in Montreal, Joly was questioned by center-right talk show host Paul Arcand over her claim the decision not to tax Netflix was based on the Liberals’ promise not to raise taxes. Joly did not specifically answer. Cartoonists have been particularly vicious over the Netflix affair, portraying Joly as vapid or a camera-friendly tall, blond, 38-year old politician more style than substance. Some of her critics on the right — usually older middle-aged men, according to her defenders — ‘cross the line’ into sexism by repeatedly calling Joly “the majorette” — a reference to a baton twirling performer usually seen in marching bands during parades. Despite the criticism, Joly rarely sat back and allowed those perceptions to go unchallenged. Dany Turcotte, the show’s co-producer tasked with creating the cards, was not happy with Joly’s change. After the embarrassing press tour ended, the issue went back on simmer mode until Feb. 5, when an opposition members of the NDP brought the issue forward once again during the House of Commons Question Time, where members can directly question the Prime Minister Justin Trudeau. Dusseault: My question primarily has to do with the Netflix agreement. Everyone is starting to understand how this agreement gives Netflix a tax advantage over its competitors. I want to follow up on this issue and on the government’s completely twisted logic. Last week, the government kept spouting the same empty rhetoric to explain why it decided to give Netflix a tax holiday. This tax holiday was granted in exchange for an investment, but there is no guarantee of this investment. Netflix is getting a tax holiday in exchange for the infamous agreement presented by the Minister of Canadian Heritage. This is what I would like to talk about today. The government gave a foreign company a tax break for doing business in Canada without having to abide by same tax rules as its competitors. This company is doing business with Canadian consumers. When it sells a product to consumers in Canada, it does not have to charge GST or federal sales tax because the government is allowing this situation to continue. The government is allowing a company to sell a product, in this case a subscription to Netflix, without charging consumers any GST. According to the government and its twisted logic, this is not a problem because that is just how things work. That is the government’s reason for not forcing Netflix to charge GST. It is possible to make Netflix charge sales tax because several other countries have already done so. Although Netflix is an American company that operates all over the world, it pays sales tax in some countries. Most countries actually have taxes associated with the sale of goods and services. Canada can make Netflix charge sales tax. It is possible. The argument that the government cannot do this does not hold water. In fact, the government is not even using that argument. In the beginning, the Minister of Canadian Heritage said that it was too complicated and that it would require an international agreement to make Netflix charge sales tax. That is completely untrue. Now the government’s argument is that it does not want to impose a new tax on consumers. Based on the government’s twisted logic, the GST is a new tax. This is like telling huge multinationals like Target or Walmart that when they come to Canada to sell their goods and services, they will not have to charge their customers GST at the checkout because that would be a new tax. This is like telling a new company that sets up shop in Canada that we cannot ask it to charge GST because that would be a new tax, and Canadians cannot afford any new taxes. That is the logic the Liberals are using today. In other words, they are saying that a foreign company or multinational that has a physical presence in Canada does not have to charge GST, although the store next door does. Can my colleague explain how the government came up with this logic? How is the GST a new tax for businesses? Casey: Mr. Speaker, I would like to thank my honorable colleague from Sherbrooke for giving us a chance to talk about the many benefits of the agreement with Netflix.This government strongly believes that the establishment of a new Canadian business in the film and television production sector by Netflix is wonderful news for Canadian creators and producers, and ultimately for our cultural industries as a whole. The approval of this significant investment in Canada under the Investment Canada Act is yet another indication of our government’s strong commitment to growing Canada’s creative industries, with new investments that create more opportunities for creators and producers across the country. In fact, this major investment of a minimum of $500 million over the next five years on original productions in Canada will provide them with even greater access to financing, business partners, and ultimately new ways to connect with audiences across the globe. Such an unprecedented investment by a digital platform in Canada, a first of its kind for Netflix outside of the United States, is yet another confirmation to the world that Canada is a great place to invest, attesting to the creative talent of this country and the strong track record of our cultural industries in creating films and television productions that really stand out. It is important to make a distinction between the cultural activities of Netflix Canada, which has committed to investing a minimum of $500 million Canadian in the production of Canadian-made films and television series, with the activities of its U.S.-based video streaming service. These are in fact two separate kinds of cultural activities. It is also important to reiterate that all businesses, including those involved in television and film production that set up and operate in Canada, must abide by the Canadian tax system, which includes GST. Given that Netflix Canada plans to operate a production company in Canada, it will have to comply with all GST-related rules, which could apply to its production activities in Canada. Lastly I would like to point out that Netflix announced last week that it has acquired the award-winning Canadian film, Les Affamés, written and directed by Robin Aubert, one of the most unique voices in Quebec’s cinema, to be made available on the international market as early as this coming March. This represents the first of many Canadian films and television series to be acquired or produced by Netflix Canada as a result of its significant investment announced last fall. Dusseault: Mr. Speaker, I know the parliamentary secretary is trying to draw a distinction between Netflix Canada and Netflix USA. I know the two are different. However, he avoided answering my question about Netflix USA subscriptions that are not subject to GST. That was probably intentional, so I would like him to comment on this specific issue. Netflix USA sells a product to Canadian consumers and, unlike its competitors, does not have to collect GST. Can my colleague, the parliamentary secretary, explain to me why a foreign company is exempt from the tax rules that apply to Canadian businesses? Why are Canadian consumers not paying tax on Netflix subscriptions? Casey: Mr. Speaker, Netflix Canada created a new film and television production company. This is great news for Canadian creators and producers. Once again, over the next five years, Netflix will invest a minimum of $500 million Canadian in original productions produced in Canada in English and in French for distribution on Netflix’s global platform. Let us not forget that Netflix already has a strong track record of investing in Canadian producers and content, with recent examples including Anne and Alias Grace with the CBC, Travelers with Showcase, and Frontier with Discovery. We believe that this significant investment in Canada demonstrates that Netflix is committed to continuing to be a meaningful partner in supporting Canadian creators, producers, and the Canadian creative expression. A day later, Caron was ready to follow up with the Prime Minister. The issue of Netflix, taxation, and to some extent Canadian content has apparently resonated with the NDP, as their members return to press the issue with the Liberals again and again. But Trudeau’s steadfast response has made it clear his government intends to bury the issue once and for all. In a sense, both sides are right. Canadian content regulations and protections for Canadian culture and the francophone community in Canada are at risk of being diluted by an onslaught of cord-cutting and new online streaming services that do not always recognize the sensitivity of these issues for many Canadians. As viewers gain new choices, especially those not subject to regulatory oversight, the dominance of American streaming services will be even more apparent than the dominance of Hollywood and American network television. Netflix is not in the business to cater to Canadian content quotas and likely never will unless the government mandates it. French language content on Netflix will largely come from European producers and networks in France and to a lesser degree Belgium and Switzerland. But Netflix’s enormous budget for content development does open the door to opportunities for Canadian productions with budgets Canadian networks like CBC, CTV, Global, TVA, and Radio-Canada can only dream about. Quality should trump quotas, and may the best productions win. Canadian telecom companies have a pervasive presence in all forms of Canadian entertainment. 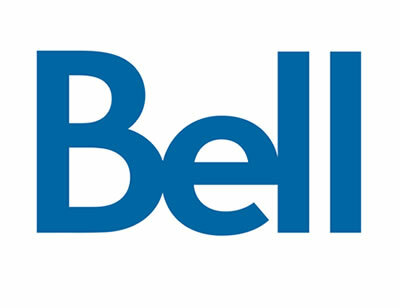 Bell (Canada) owns Bell Media, which in turn owns CTV – Canada’s largest privately owned commercial network. City, which has network affiliates in Canada’s largest cities, is owned by Rogers, Canada’s largest cable operator (Rogers also owns Omni Television, a multicultural network). Global is owned by Corus Entertainment, which in turn is controlled substantially by Shaw Communications, western Canada’s largest cable operator. Canadian cable and telco-TV providers run their own streaming services which are subject to sales taxes, while foreign streaming companies like Netflix are not. There is a case to be made for a lack of a level-playing field. But Prime Minister Trudeau is also correct stating that any new taxes imposed on Netflix Canada or other new entrants would immediately be passed on to subscribers and raise the price of internet services. The Liberals’ platform during the last election insisted that the party wanted universal access to affordable broadband service for all Canadians and no taxes on Netflix. For many consumers, the price of content and the price of access are essentially the same thing. Netflix has thrown a “token” $500 million at the problem in hopes of placating its Canadian critics. It may be enough to satisfy Vancouver and Toronto, where many series and movies are filmed, and it certainly has “resolved” the matter for the Liberal government of Mr. Trudeau, but it seems unlikely to soothe the concerns of Quebec and its vocal and proud francophone community. Quebec could move forward and impose a provincial sales tax on Netflix at any time, and will likely continue to pose a challenge to Netflix Canada until the company seems more sensitive to the concerns raised in many quarters in Montreal, Quebec City, and beyond. The creative community of French Canada can deliver some excellent productions, so long as Anglophiles are willing to read subtitles. Netflix may have to spend more money to make certain those types of shows turn up on the service in the not too distant future. The European Commission’s latest study on broadband pricing shows while Europe and Asia offer consumers affordable broadband, North American providers are forcing Americans and Canadians to essentially pay twice as much for equivalent levels of service. Just as was the case in 2015, the report found some of the most costly broadband packages in the world are sold to customers in Canada and the United States. This year, the study found the average Canadian paid more than $52 a month for standalone broadband, in the U.S. an average of $42 a month. In contrast, Europeans paid an average of $30 and Asians paid $22 a month for comparable service. Customers in the U.S. and Canada with a triple play bundle package of broadband, TV, and phone service paid more than double what their counterparts in Asia and Europe did last year. As U.S. and Canadian providers raise broadband speeds and constrict the number of service tiers they offer, customers are forced into more expensive tiers, whether they need or want them. That further exacerbates the digital divide based on broadband affordability. In Europe, competition in many EU member states has caused prices to drop for some types of service. Double and triple play packages offering 100Mbps or less declined in price by as much as 10.6% in 2016. 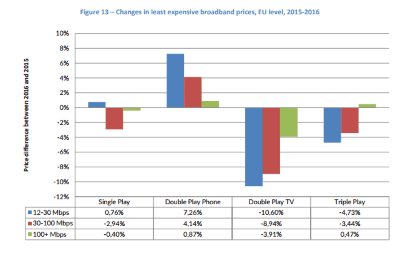 Broadband prices for budget tiers actually dropped in Europe last year. For the download speed basket 12-30Mbps, the EU vies with Japan and in some cases Korea showing the least expensive prices in one or more of the four service bundles. The lowest price for Double Play with fixed telephony in the €28 is also the lowest compared to all the countries analysed. The EU, Japan and South Korea have relatively similar prices when compared with Canada and, in particular, the USA. Comparing the €28 with other countries in the world, the pattern in the 30-100Mbps speed basket is similar to the 12-30 Mbps basket. Japan is the least expensive country for three of four bundles; only Single Play is slightly less expensive in South Korea. Here, the EU28 just fail to present the lowest price for Double Play with fixed telephony. Again, the EU, Japan, and South Korea stay at more or less close compared to Canada and the USA. Alternatively, Canada is the most expensive country in three of four bundles. However, USA shows the most expensive Double Play with fixed telephony – despite considering the lowest price offers in three States there. With regard to the 100+ Mbps basket of advertised download speeds, Japan and South Korea are decisively the least expensive markets, across all service bundles. South Korea has the least expensive offer for Single Play, Japan for Double Play including TV services. For the top download speed basket, the EU lies in mid-field between the low-cost Asian and the high-priced North American countries. • Compared to Japan and South Korea, European citizens have to pay similar prices for offers of up to 100Mbps, but significantly more for ultra-fast connections.